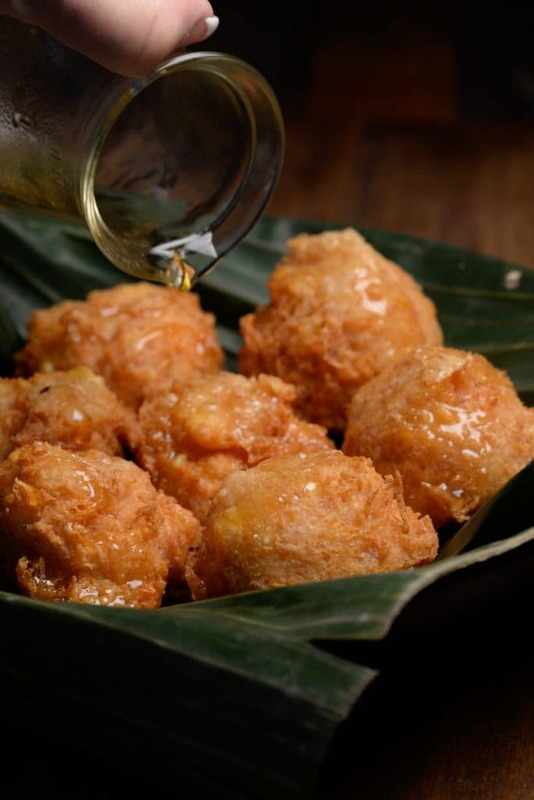 Nicaraguan yuca donuts called Bueneulos de yuca are scrumptious donuts made of cassava/yuca. 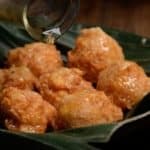 These treats are fried and then served in a sweet syrup sauce flavored with lemon and cinnamon. They are easy to make and we enjoyed them immensely with a nice strong cup of Nicaraguan coffee. The yuca or cassava root is grated and then mixed with some grated cheese, an egg holds together the mixture along with a touch of baking powder before they are deep fried to a golden brown. The result is a cheesy sweet delicious bite of goodness, YUM! Place the syrup ingredients with the exception of the lemon juice in a large pot. Allow to cook to syrup stage at around 220F. or until the syrup coats your spoon. Add lemon juice, mix and set aside. Using a spoon scoop the dough into your hands and form little balls. Once golden brown, drain on paper towels any excess oil. Drench the donuts in the warm syrup and serve.